From July 28th to August 5th, one of our team members, Hugo Lefeuvre (also a Debian Developer on his free time), attended DebConf18, the annual Debian Developer’s Conference, in Hsinchu, Taiwan. During this week, Hugo spent time preparing and giving a talk about Ring, hacking on Debian packages, discussing free software communication and distributed networks with fellow developers and users. Just like last year’s edition, DebConf18 has been a very enriching experience for us. 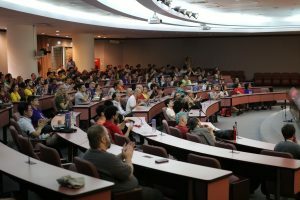 DebConf is a great way to not only to rekindle old friendships but also make brand new connections between free software developers from all around the world. It is also a knowledge sharing platform; an excellent place to get mature and informed feedback, reviews and critical comments from a third party perspective. Hugo’s talk – “Challenges of Ring – a free and universal distributed communication platform” mainly intended to give an overview of the Ring project by discussing some of the challenges arising from its development process. By choosing the developer’s point of view in order to present the Ring project, we wanted to show what it is like to be a Ring developer, and more generally, how interesting it is to be a pioneer in the free and distributed communications domain. We hope that it sparked interest among existing and the new Ring developers. The talk was followed by a Q&A session during which we discussed various topics such as privacy impact of Firebase embedded in our Android client, and how to develop a workaround to tackle this issue. Participants were also interested to explore battery footprint on Android, or the usage of blockchain in our name server. This was indeed a valuable moment to us, and hopefully to all attendees. We’d like to thank DebConf18 organizers and sponsors for all their humble efforts to make this edition a success, and cannot wait to see you again next year DebConf19 in Brazil!